Following on from the last posting, here's yet another photo of Church Street looking towards Salford. This one dates from 1930 (approximately) and is taken from slightly further up the street. Interesting to see how far forward the shops on the lower side of Shorrock Fold (where the two women are) came out, before that block was redeveloped in the late 40's / early 50's. Once the Littlewoods building and adjoining properties were built, the shop fronts were set back quite a few yards, leaving quite a wide pavement area at that point of the street. Lovely photo this one, just look at those cars and the fashions of the time. If there were skyscapers on either side of the street, it could quite easily be Chicago we're looking at. Looks like Market Street in Darwen. Looks like Church St in Blackburn to me. The caption on the photo is a bit of a clue. Don't worry Roger, I've made far bigger mistakes than this elsewhere on these sort of sites so please keep contributing. You've got me confused Roger. I thought you were talking about the 'Unknown' photo, yet you have left your comment under this photo of Church Street. 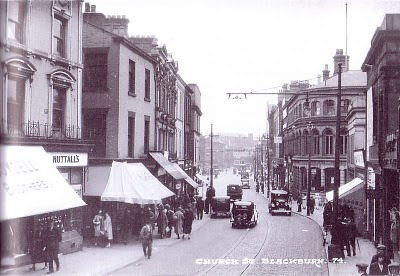 As John says, this is definitely Church Street - Blackburn. I thought your comment had disappeared, as I was looking under the 'Unknown' picture. This is a really nice Photo of Church St and shows what a vibrant place it was in the 30's. Why did the Town Planners have to go and spoil it by closing it off and dumping a load of scrap metal on it ? It was part of the main shopping area of the Town Centre along with the old Market / Victoria St / Darwen St and King William St. At this weeks opening of the Wainwright Bridge the CEO of the council said "This will open up the route to the centre of Blackburn"...Sorry Mr CEO but when was Montague St / King St the centre of the town ! They should reopen Church St to traffic and make Darwen St two way again then you would have true route to the centre of Blackburn.